Maine's delegation and health experts warn that 'very shortsighted' funding cuts could expose more kids to harm. The Trump administration is proposing to eliminate two Environmental Protection Agency programs that reduce children’s exposure to lead-based paint, a toxin that can cause permanent brain damage and is particularly prevalent in Maine because of its older housing. The proposal, laid out in an internal budget memo made public by The Washington Post, is receiving a chilly reception from Maine environmental health experts and the state’s delegation to Congress, which has the final say over the federal budget. The EPA programs educate the public on the issue and ensure that when lead paint is discovered and removed it is done in a way that reduces rather than increases children’s exposure to the toxin. The agency is proposing to slash the staff working on these issues by 73 and to eliminate the grants it gives to states and tribes to oversee the training of contractors to properly remove lead paint. The move would save the federal government less than $17 million. Lead was banned from most paints in 1978, but older homes – especially those built before 1950 – often have the toxic substances on their walls. Maine has one of the highest proportions of homes built before 1950: 30.2 percent of the housing stock, compared to 18.4 percent nationally as of 2015, according to the U.S. Census Bureau. While some regions of the country have brick, stone or stucco-clad homes, almost all of Maine’s are wood-framed structures with exterior as well as interior paint, including many rental apartment buildings in urban areas. Nearly 300 Maine children under age 6 tested positive for lead poisoning in 2015, according to the Maine CDC, and of those, 232 were under the age of 3. Maine law was changed in 2016 to conform with the federally recommended threshold for lead poisoning of 5 micrograms of lead per deciliter of blood. The EPA memo described the lead grants to Maine and other states as a “mature program,” the funding responsibility for which would now be shifted to state and local governments. The proposal runs counter to the administration’s desire to modestly increase funding for a Department of Housing and Urban Development program that helps fund actual lead paint cleanup efforts. The White House’s initial budget proposal calls for a $20 million increase to $130 million. “It’s nonsensical to increase the HUD funding and roll back the EPA’s because the EPA programs are the ones that make sure the remediators get trained so they can do the work correctly,” said MacRoy, the Environmental Health Strategy Center deputy director. In recent years, EPA grants have helped the Passamaquoddy and Penobscot tribes and the Aroostook Band of Micmacs conduct risk assessments for lead-paint exposure on their reservations and public outreach and education to encourage parents in at-risk buildings to have their young children tested. In 2010, the Maine Department of Environmental Protection received $75,000 to set up programs to oversee renovators who deal with lead-based paints. 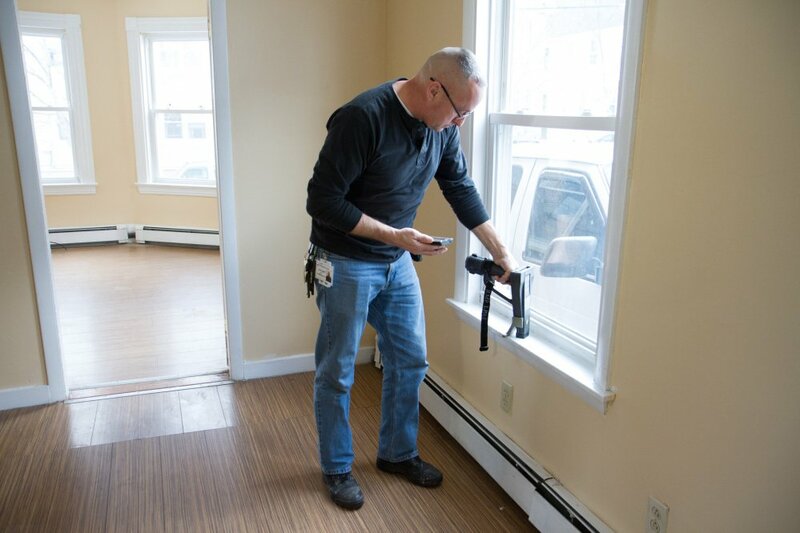 In May 2016, the EPA sent inspectors to the Lewiston-Auburn area to ensure home renovation contractors were properly trained and complying with federal laws regarding lead-paint removal. Children in those cities get lead poisoning at three times the rate of the rest of the state, the Maine Center for Public Interest Reporting wrote at the time. Maine’s four-person congressional delegation consists of two Republicans, a Democrat and an independent, and all of them are taking a dim view of the proposed lead cuts at EPA. Sen. Angus King, an independent who caucuses with the Democrats, said in a written statement that he was concerned the cuts would slow Maine’s progress in addressing lead contamination. “Federal funding has long played an important role in supporting state and local lead abatement efforts, and I will continue to advocate for full funding to help ensure that Maine homes and Maine children are safe from lead,” said King, who signed onto a letter from 26 senators to Sen. Susan Collins – who chairs the appropriations subcommittee dealing with HUD – asking her to increase that department’s lead control funding to $230 million, a much sharper increase than the president’s proposal. Collins’ spokeswoman, Annie Clark, said via email that the senator has long championed increased funding for programs that address lead abatement, especially at HUD, whose budget falls under her subcommittee’s purview. “Every president’s budget is subject to significant revision by Congress,” Clark noted. “While Senator Collins was pleased to see increased funding for lead hazard control programs in the president’s ‘skinny’ budget, she was deeply concerned that it would eliminate the Community Development Block Grant Program. Gov. Paul LePage’s office declined to comment on the proposed cuts. His spokeswoman, Adrienne Bennett, said it would only do so if and after it receives “formal documents or directives from EPA” on them.